We are honoring veterans by highlighting all of our military fiction and non-fiction in book displays around the library. Paul Petry, a surviving WWII Army veteran living in Heyworth, has a display of his mementos and memories of his time of service to our country. Mr. Petry reported for active duty in May of 1945 at Fort Sill in Oklahoma and went on to a tour of duty in France. Thank you to all who have served and are serving our country protecting our freedoms. The library will be closed to honor Veterans’ Day on Friday, November 10. 2nd and 4th Thursdays of each month, 6:30 p.m. -7:30 p.m.
We are thrilled to offer knitters and crafters a space to create and socialize! This group is very willing to teach anyone who would like to learn to knit. We have yarn, instructions for the beginning project, and needles to get you started on a new hobby. If you want to learn how to knit you must sign up to attend, so our group can have all you need ready for the evening. If you are a knitter or a crafter looking for a group of knitters in our area, just show up as your schedule allows. Available to anyone 4th grade and up. 1 p.m. – 7:30 p.m.
3rd – 5th graders are invited to join us in reading Harry Potter and the Sorcerer’s Stone by J. K. Rowling. Fun activities are planned for the afternoon, also come dressed as your favorite character. The book being discussed is A Separation by Katie Kitamura. Copies are available at the library. 3rd Wednesday of each month at 3:30 p.m.
Join us for all things Lego! Sign up at the library. K – 8th grade. 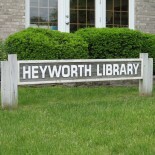 This entry was posted on October 25, 2017 by Heyworth Public Library District.